South Korean internet giant Naver on Thursday reported that its third-quarter revenue surged 20.5 percent on-year to reach 1.01 trillion won ($890 million), led by growing sales from its overseas and mobile businesses. It is the first time ever that Naver’s quarterly earning has surpassed 1 trillion won, the company said in a regulatory filing. In the July-September period, Naver’s operating profit surged 27.6 percent from a year earlier to 282.3 billion won. Its consolidated net profit came in at 198 billion won, up 69.5 percent on-year. The Korean web portal operator attributed the sharp increase in its third-quarter earnings to high growth in its overseas sales, mostly generated by its mobile messenger app Line, as well as mobile advertisements. Spearheaded by Line’s earnings, Naver’s overseas sales reached 370.7 billion won, taking up 37 percent of the firm’s total revenue in the third quarter, the company said. The Japan-based Line Corp., a subsidiary of Naver, is the operator of Line, which boasts some 218 million monthly active users. Its core markets are in Asia, with Japan, Taiwan, Indonesia and Thailand accounting for more than two-thirds of Line’s total market. By category, advertisements accounted for the biggest portion of Naver’s third-quarter revenue. Advertising income grew 27.7 percent on-year to reach 749.5 billion won, with overseas advertising revenue accounting for 21 percent of the total. Sales generated via Naver’s content business, which includes stickers sold via Line, mobile games and paid webtoons, fell 3.5 percent on-year during the third quarter to 227.6 billion won. 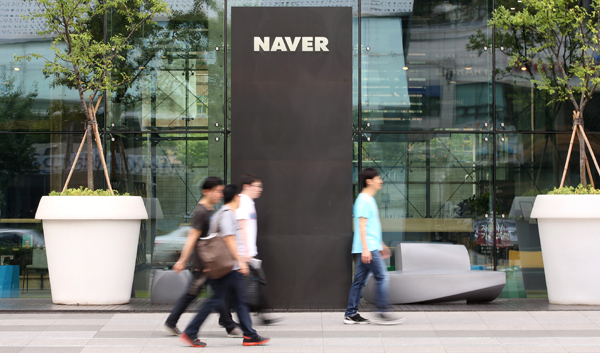 Around 88 percent of Naver’s content business revenue is generated overseas, according to the Korean internet giant. Sales of Naver’s remaining businesses categorized as “others,” which includes sales of Line character merchandise, rose 27.6 percent on-year to 282.3 billion won. “We will continue to invest in new technologies, expand partnerships with diverse partners and recruit more talented individuals to drive up our technological competitiveness in the global market,” Naver CEO Kim Sang-hyun said in a statement. In the first nine months of the year, Naver’s total sales reached 2.94 trillion won, while operating profit came in at 812 billion won and net profit at 576.3 billion won. Shares of Naver rose 1.3 percent from the previous trading day to close at 859,000 won Thursday.